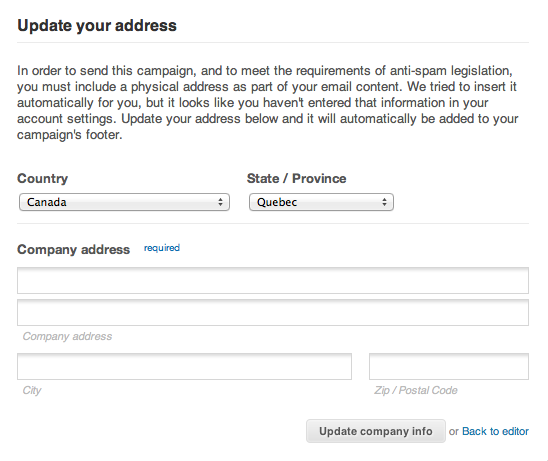 In compliance with Canada’s New Anti-Spam Law (Bill C-28), The CAN SPAM ACT of 2003 and CakeMail’s existing Anti Spam Policy all senders using our service MUST include the physical postal address of the sender in their email, along with an unsubscribe tag. Not only is it illegal to send commercial-based email without a valid postal address, it goes against Sender Best Practice of not showing proper accountability to the recipient. The receiver should be able to readily contact the sender (by any means possible) if they no longer wish to be contacted via email. Failure to adhere to this policy will result in the termination of your CakeMail account. In order to protect you (and us!) from this happening, we have modified our existing detection system to alert us so we can properly resolve this issue before it happens. In CakeMail 3.2, the system automatically searches for both an unsubscribe and an address tag. If they are not detected, you will not be able to move forward and schedule your campaign. Previous PostMore languages available in CakeMail!